CRUISE Fashion is one of the leading retailers within the premium, designer and luxury industry. Established in 1981, the clothing giant has grown to have a huge following. CRUISE Fashion stock the latest designer brands, from Alexander McQueen to Barbour, Stone Island to CP Company. 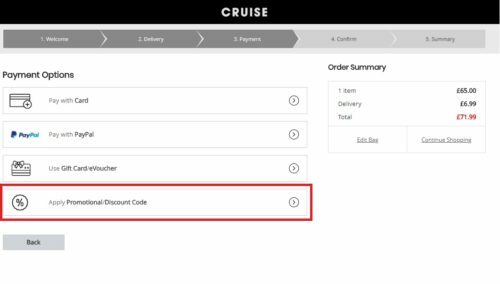 CRUISE Fashion often run extra % off codes throughout the year, these tend to be on the already discounted outlet store. 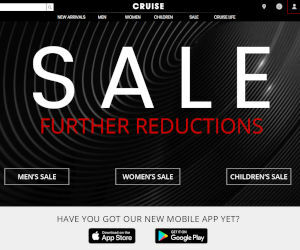 CRUISE Fashion discount their clothing with two seasonal main sales and then two mid season sales. Each sale is accompanied by a voucher code that gives you an extra % discount at CRUISE Fashion. Head to the outlet first before checking out the rest of the site if you are a great deal. Discounts go up to 90%. Let's be honest, designer clothing is expensive! Fortunately we have been following Cruise Fashion for over 6 years so we know the best times for discounts and sales. You do tend to find there are more offers on Christmas Eve, Boxing Day with heavy promotions in January. Whilst there is always an outlet section of the website, there are times when Cruise Fashion will release a 10% off extra voucher, redeemable for a short time. Can I get Student Discount from Cruise Fashion ? Unfortunately Cruise Fashion are not offering any sort of Student Discount at this time. Should this change, we will update this section of the page with the best possible discounts. Which popular brands do Cruise Fashion sell? Sometimes you can't find what you are looking for online, somethings you prefer to try the clothes on in person. Whatever the reason it's important to know that Cruise Fashion have over 7 stores around the United Kingdom, offering a robust collection of designer clothing. These locations include Newcastle, Derby and Aberdeen.